The whatwolves, whenwolves, and whywolves. To get to "THE OTHER SIDE." It had no BODY to dance with. What happens when a ghost gets lost in a fog? 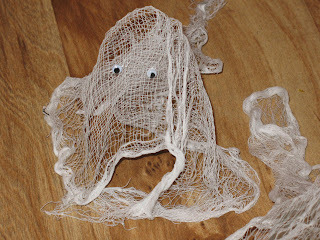 Why do guy ghosts have so much trouble dating? What do you call a little monster's parents? ANSWER TO THOUGHT FOR THURSDAY: Here is a list of the most searched for candy during 2007, according to yahoo. The ever popular tootsie roll was the most popular Halloween candy in 2004. See the statistics here. So, what will it be this year? We'll have to wait and see. 1) Stainless is Sustainable: Use stainless steel silverware, regular plates, and cups – don’t buy paper plates and plastic silverware. They just cost more money and waste space in our landfills. 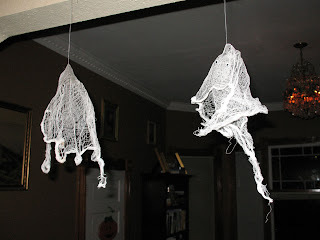 Have your kids go as ghosts. 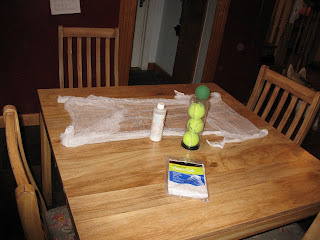 Use an old white worn out sheet. Just cut out eyes and mouth holes. 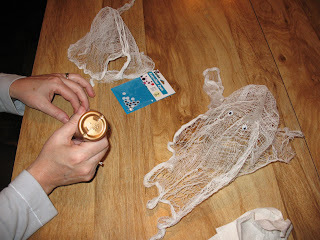 It will be fun making the costume and won’t cost a penny. 3) Don’t Brown Bag It – Make it Green: Use an old pillowcase for a treat bag, decorate it with sharpie markers, or use a cloth or canvas bag. You can find these eco-friendly alternatives to paper and plastic at your local grocery store. Americans use more than 380 million plastic bags and more than 10 million paper bags. These bags kill thousands of marine mammals annually and pollute soil and water. Plus, paper bag production consumes more than 14 million trees annually. Go Green! 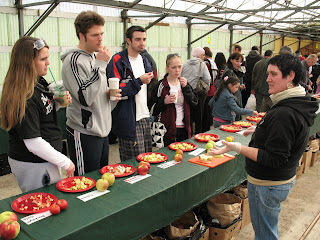 4) Seasonal Support: Buy local pumpkins, apples and other farm fresh produce. By buying locally, you’ll help your own community by keeping your dollars circulating where you live. And, in the United States some food travels over 1000 miles before reaching its destination. This wastes fossil fuels along the way. 5) Have a Heart-Healthy Halloween: Don’t drive the kids around this year, walk with them and stay close to home. This will help you save gas, and money, while giving your heart a little exercise. 6) In the Fall - Use it All: After you’ve carved your Jack-o-lantern, clean the seeds off and bake them in the oven with a little olive oil and salt. It’s a healthy homemade snack and if you don’t like those seeds feed them to the birds (wet or dry). And, last but not least, after the holiday compost your pumpkin. This will feed your garden and reduce the waste in our ever growing landfills. I found this challenge on Cindy's blog. 2) I went cliff jumping a couple years ago when we went white water rafting – call me crazy – looking back I agree. 3) I’m tone deaf – oh wait, a lot of people already know that – at least anyone who’s heard me sing. 4) My sister and I have rhyming names: Kimbra Fay and Tambra Kay – Mom had nine kids and must have been running out of names. 5) My grandfather (Dad’s Dad) was an Indian, okay “Native American” for all you politically correct people. He was born on the Indian Reservation in Pawnee, Oklahoma. So, that makes me part Indian too. You can’t tell from looking at me – but you can see it in my brothers and sisters. 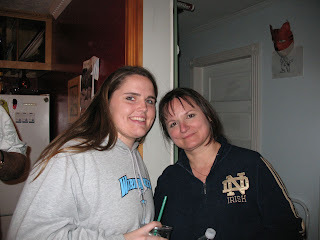 I took after Mom’s Irish/English side of the family. 6) My grandfather (Mom’s Dad) was the Vice-President of Union Oil when he died. So Mom came from a wealthy family but like I said (see 5 above) she married an Indian and that was not something to be proud of back then. 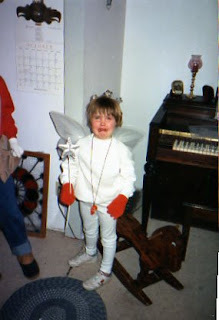 7) I grew up VERY poor. See 5 and 6 above. But Mom was the kindest person I’ve ever met. She put absolutely no value on material possessions. 8) WAIT, that’s more than 7. 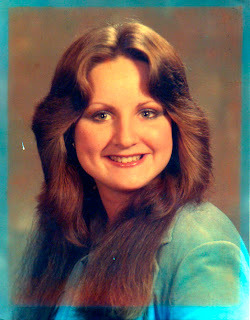 But, I could go on all night talking about my Mom – she passed away in April of this year – (sigh) I soooo miss her. 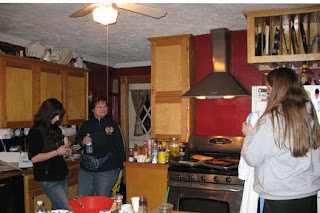 Okay, and I tag Adrienne, Rena, Kelly, and Ello. 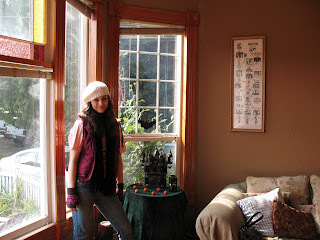 Thought for Thursday - Halloween ? QUESTION: What was the most popular candy in 2007? And what was the most popular Halloween candy in 2004? Two chances to win here. 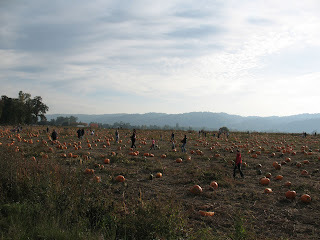 There are pumpkins in these photos - at least two of them. 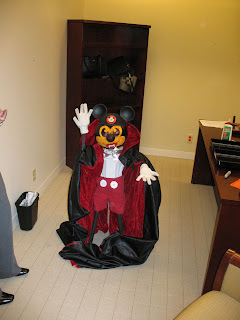 Vampire Mickey - is a pumpkin head, we decorated this guy for a pumpkin carving contest. He blends Disney and Horror in one pumpkin head. 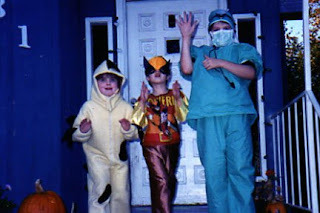 It's been a long time since my kids went trick-or-treating. 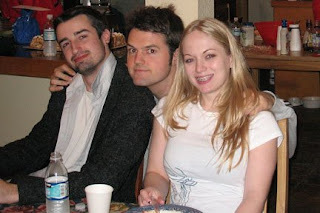 But here are a couple of my favorite photos from way back when. 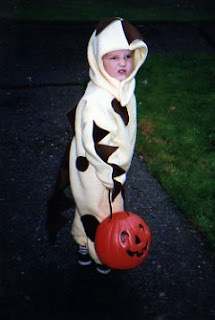 Jacob was only 3 and he wanted to be a mean dinosaur. When we told him he was soooo cute - that really made him mad. Luke has always loved Wolverine and Kara never wanted to be an angel. Jacob always says if acting and/or art don't work out for him, he might go back to school and try medicine. A Mom can only hope. . .
1. Visit lots of other blogs and make comments. 2. 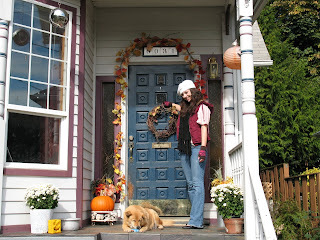 Enter the drawing on Angela Nickerson's blog for one of three fabulous goodie bags just click on the Blogapalooza below. Well, almost . . .
We were driving to Reno. Imagine a station wagon filled with nine kids, heading off on a 13 hour drive – or an eternity of “Are we there – yet?”s. I was the one who wasn’t all right, my bladder was literally about to explode. 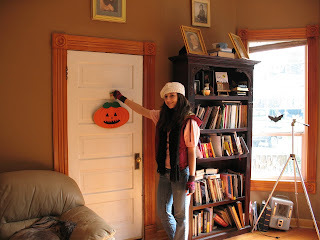 Finally, Mom tried the doorknob and the little girl was gone. She’d disappeared. We looked around and couldn’t find her anywhere. I still HAD to go. So Mom stood directly in front of me, watching me go, and even kept the door slightly open – just in case some alternate dimension opened up and tried to swallow me down into the toilet. Senior Year Photo - OMG - Now that's Scary!!! It's truth or dare, "blog dare". Fellow bloggers are daring us cyber-buddies to bare it all - well in regards to the past and present and how we've aged over the years. 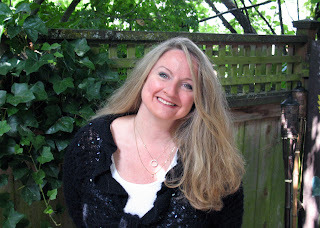 I picked up this post-dare from Kelly Polark but she's much younger than me - obviously. So how scary is it when it's only been about 10 years since you graduated, or I'll even give you 20??? ANSWER: Not nearly as scary as 30!!! I went to UofO that fall. I was only 17. That's where I met my wonderful husband and we've been together ever since. Lines, touch-ups and I'm not going bare - oh my!!! 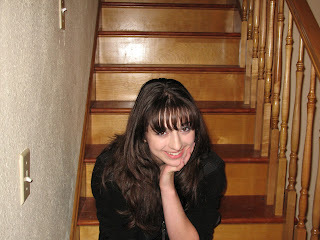 Oh and I just popped over to Brenda's page and found her senior photo :) too. And Rena's. Bloggers are a bunch of good sports. Okay, to be honest, when I first read it was a story of homicidal faeries, I wondered . . . how scary can little leprechaun-like lads and lassies really be? 3) Did I mention the romance??? I like stories that are dark and sinister but realistic too. It has to seem possible and believable no matter what the characters may be. I grew up reading Poe and King and, as far as I’m concerned, Maggie is following in these giant’s footsteps. She makes the impossible . . . possible and the Celtic folklore read like legacies more than legends. I loved the Twilight series and Maggie has managed to commingle her story and love-triangle in much the same way as Stephanie Meyer wrote of Bella, Jacob and Edward. Maggie has taken Deirdre, Luke and James and woven the same type of wicked web we readers are looking (and hoping) to get snared into. And I hadn’t even thought about it until now but my sons are Jacob and Luke – but that is only a little bit of the reason I liked these two characters so much. In Twilight, Jacob was the good guy. In Lament, you’ll have to read the story to figure out whether Luke is the good guy or . . . not. You will have to decide if you are Team Luke or Team James, this time. And, I can assure you, it won’t be any easier. Deirdre starts the story with kategelophobia, yeah. . . you’ll have to look that one up . . . or read the story to figure it out. But in the end, . . . or wait you’re going to have to read the story. 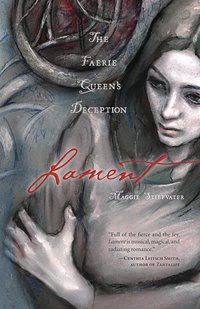 I don’t want to give any spoilers but let me tell you, if you’ve been watching True Blood on HBO, or recently finished the Twilight series, Lament should be the next thing on your list. Check it out here. You have to listen to a short (10 second'ish) ad first - but it's worth the wait. I took the Harry Potter Personality Test, which I found on Ello's site. I guess I'm a Dumbledore. Harry Potter Personality Quiz If you want to take the test, click on the Albus Dumbledore square or the underlined words of Harry Potter Personality quiz. ANSWER TO THOUGHT FOR THURSDAY: Daniel Boone, Paul Revere and Betsy Ross were issued in a Pez U.S. Bicentennial series. This was the only time Pez broke their rule against modeling their dispensers after real people . . . until June of 2007. Then on June 25th, 2007 Pez released Elvis dispensers and not one but three styles have been made of the King. And then they made a 3-piece set out of the gang at Orange County Choppers. So Pez has not only issued dispensers modeled after three people, but 7, (with Elvis having three styles all to himself). So a total of 9 dispensers have been modeled after real people, as of today's date. Sorry, my source was out of date - it was printed before 6/25/07. So, I learned something today too. I remember waiting to turn 15 to get my driver's permit and being soooo excited when my sweet sixteen came, 'cause I could get my driver's license and finally be free!!! But, today, the coolest thing (and cheapest, with the price of gas what it is) is being the person with an undriver's license. Have you ever heard of undriving? This is one way to go totally green and unpollute. Captain Planet used to say, "By YOUR powers combined, I am Captain Planet." He'd encourage kids not to pollute but back then I don't think he'd coined the phrase , "unpollute". You've gotta love it and I say, "GO PLANET!" If you're interested, read more about an undriver's license and undriving here. QUESTION: Who were the only three real people (before June 2007 - sorry, source was out of date)to have their likenesses featured on Pez candy dispensers? Who did it?. . .a friend. . .a goblin. . .a neighbor? 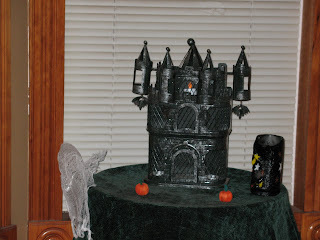 Here is a small way to spread some Halloween fun throughout the office. The goal is to Ghost as many people as possible before Halloween! Please Ghost two friends or neighbors. Keep the ghost on your name plate so that everyone knows who’s been Ghosted – be a sport – let’s Ghost everyone! 4) Tape a ghost square on the name plate of each person you are Ghosting so everyone knows who’s been Ghosted! 5) Shhh. . . it’s a secret! 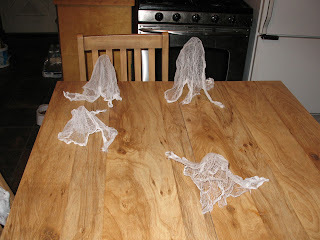 If you don’t want to participate, pass the treat, letter and ghosts to someone else. Cut and tape one ghost on the name plate of each person you Ghost. 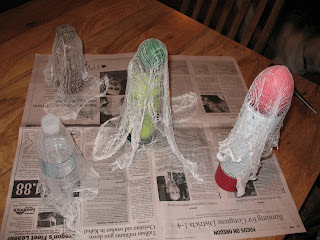 Another Shocktober Project to do with the kids. 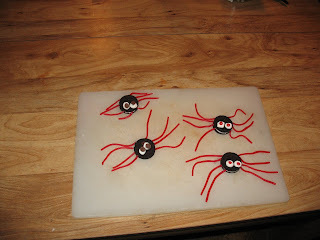 Cut the licorice whips down to spider leg size, stick in the sides of Oreos with a toothpick, put marshmallows as eyes with chocolate chips or red hots for pupils. Creepy-crawlies that are soooo yummy - especially with a tall glass of milk. It was another fun-filled weekend. First Luke and MacKenzie came home and we celebrated Luke's 21st Birthday!!! 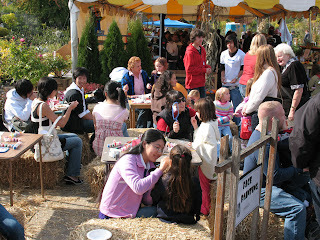 The festival also offers face painting, balloon art, music and more. We used to do these things every year while the kids were growing up. 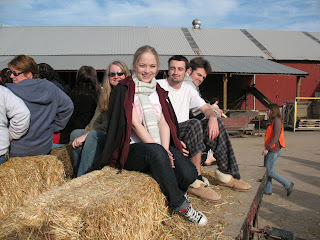 It was fun stepping back in time and appreciating all these activities with my kids, now that they are grown up. 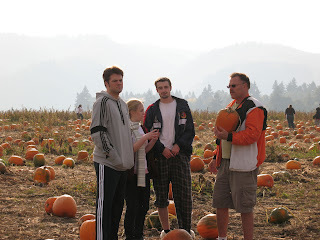 We wandered the fields to find the perfect pumpkin. 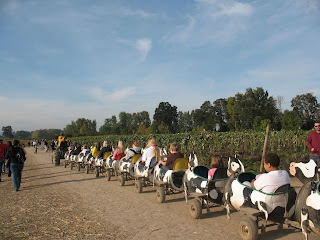 We saw a little moo train, which was for the kids to ride if they didn't want to ride the hay ride. Easy microwavable Caramel Apple recipe (I love EZ recipes that take little to no time) but I still want the food to taste good. 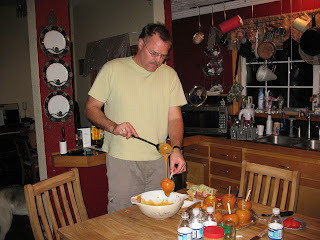 Shove sticks in center of apples and Dip apples in caramel. Set caramel apples on cookie sheet, covered with wax paper and/or buttered to let caramel stiffen. Eat and enjoy – yum!!! Monday was Luke’s 21st birthday. Jake drove down to Eugene after working all day to take his ‘lil brother out for a drink . . . or two. They had a good time but Lars and I missed out on the fun. 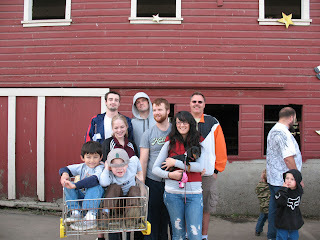 So Luke and his gfriend, MacKenzie, drove to Portland Saturday morning so we could have a family celebration. We had the family over for lasagna and then ate cake and ice cream and tried to sing Happy Birthday to Luke - you can listen and see for yourself how we fared. 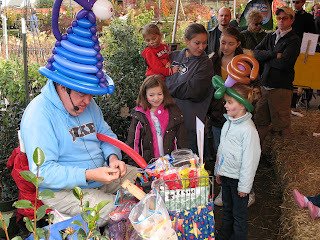 Here’s a short clip and some pictures to share the fun. 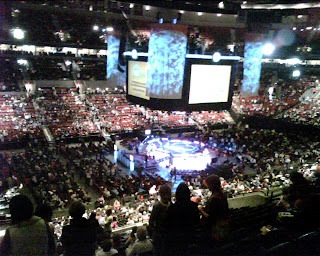 I spent last Friday night and Saturday at the Women of Faith conference here in Portland, Oregon at the Rose Quarter Arena. 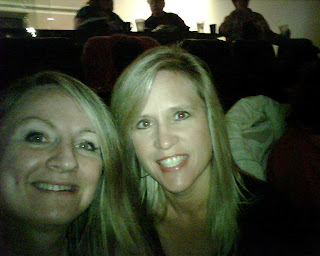 The voices of American Idol's Mandisa, Sandi Patty, Nicole Mullen and Sheila Walsh were unbelievable. Friday night Denise and I went together and Saturday Janice and I went. I took a couple of photos with my phone. My husband and I went to listen to William P. Young give a lecture at Warner Pacific College, here in Portland, Oregon Monday night. I raised my hand and told the author that I felt the book was really two stories rolled up into one book and I asked him if he wrote it that way intentionally or if he wrote it in bits and pieces. He said, he started the book because his wife, Kim, wanted him to write something down that he could give to his children. He intended the story to be that gift to his kids for Christmas. And originally he went to Office Depot and printed out fifteen copies for his family and friends, never intending it to go any further than that. Today, The Shack has sold over 4 million copies. He answered my question by saying that he started out by writing the conversations, as questions he wanted to ask as a child but was never allowed to ask. He was warm and funny but even more. He was Real. 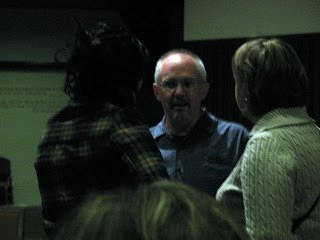 He spoke from his heart about difficult subjects and he had the audience on the edge of their seat for the nearly two hours he shared his story with us. 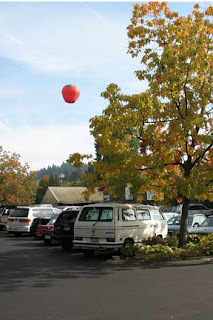 Here is a short clip of him talking about growing up in Boring, Oregon. Yes, there is a place in Oregon that is truly Boring. Turning TRASH TO TREASURE, we’ve all heard the phrase. But how’s a person to do it? I’d be lost without my husband around but, with him leading the way, it’s easy. He’s a wanna be carpenter – some of the time. Both his brothers work with wood all day, while my husband sits in an office pushing paper to support his family. But at home, he manages to express himself with scraps of wood he finds at recycling centers. Here's just one example of what he's made with his scraps of wood. 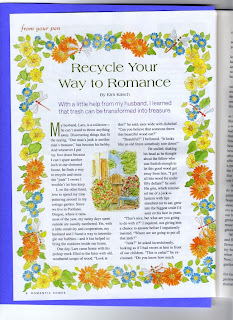 Here's a story I wrote about Recycling Your Way to Romance, which was published by Romantic Homes magazine. If you want to read the entire story of how to turn trash to treasure, read it here. And the next time you think about throwing something away, think again. THOUGHT FOR THURSDAY - Lit ? Okay, it's only fun if you don't google it, until after you answer it. 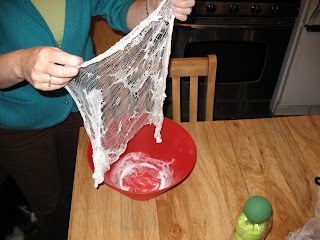 Who wrote, "Oh What a Tangled Web We Weave, When First We Practice to Deceive." It kinda goes along with my Mark Twain Quote of the Week. My theory is, if you don't lie, you never have to be careful what you say. Okay, I know there are other reasons to be careful: you might hurt someone's feelings, offend someone, journey into the toxic topics of politics and/or religion, without even thinking about it but at least people won't have to guess where you stand on the subjects. Happy Thinking. . . and try not to get tangled up by your tongue. The Jacketflap of the movie said “terrifying horror thriller” well worth seeing. 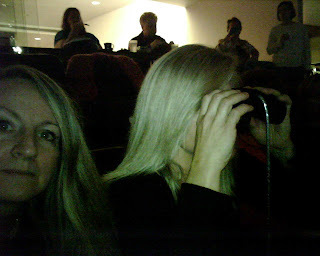 It was worth seeing but, IMHO, it wasn’t terrifying or horrifying - not in the least. It was more like "a little creepy". Along the lines of Nicole Kidman’s "The Others". My husband and I watched it together. He kept saying, “Where’s Carlos?” whenever anything was wrong. And it’s true. Where was the husband all the time? [A bit of a spoiler here] No wonder he wasn’t in her thoughts at the end. My niece helped me decorate. It's that Black Cat/Bat time of year again. as she flew across the room. The sixth one zoomed high into the sky. The eighth witch brought along her little black cat.